For nearly 60 years, automotive brake-component manufacturer Util Group, headquartered in Italy, has been supplying many of the world’s OEMs of cars, trucks and other vehicles with fineblanked and stamped backing plates, brake shoes, piston clips, springs and other parts. Most recently, it launched production of components for the 2017 Volvo S90, Jeep Cherokee, Hyundai Veloster and Tucson, and Mazda CX-5. Util fineblanks brake backing plates with dimensional accuracy to within ±0.05 mm, and edge perpendicularity to top and bottom faces to within ±0.0125 mm. 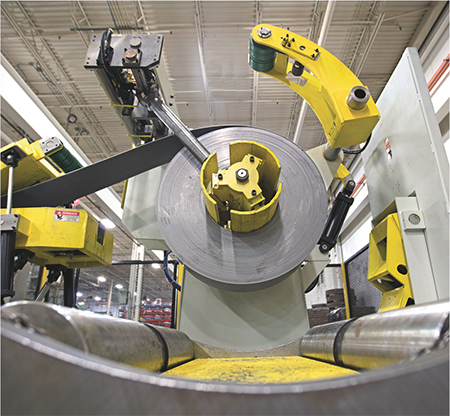 As explained by Frank Taraschi, president and general manager—Americas, the firm operates four facilities employing 1400 people around the world, and is an early adopter of fineblanking technology—a process widely used for forming brake backing plates, which require tight tolerances on flatness and dimensions. 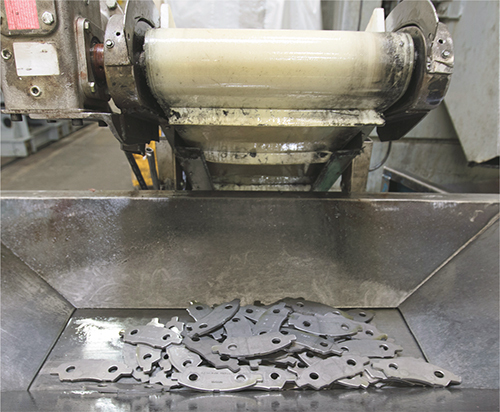 Targeting the market for fineblanking of high-strength tight-tolerance parts, Util pioneered the use of the process in 1968 to produce brake backing plates and shoes. Globally, Util employs 25 dedicated hydraulic-press fineblanking lines, with press capacity from 600 to 880 tons, and consumes some 90,000 tons of steel/year. Its Canadian facility (in Concord, Ontario), with seven of these lines, is the focus of this article. That facility consumes approximately 45,000 metric-tons of steel/yr. Late in 2016, Util Canada installed a new state-of-the-art fineblanking line, which plant executives expect to help open doors to new work and new customers. Of the facility’s 20,000 sq.-m. of manufacturing space, 9200 sq.-m. is dedicated to fineblanking. The plant also includes aftermarket production, inhouse tooling engineering and manufacturing, plus warehousing and distribution. 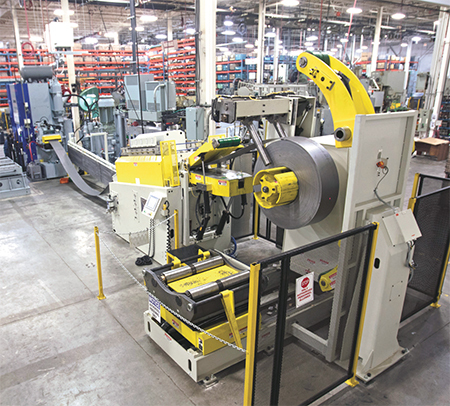 The Canadian plant’s latest fineblanking line features a hydraulic press from Mori Iron Works Co., fed by a uniquely specified feed line from Coe Press Equipment. The feed line features a Coe Fineblanking Edition HD straightener, coil reel with HD holddown arm, and alligator-style peeler-threader. “Our Canadian operation serves as the center of technological excellence for the Americas,” says Taraschi, “and mentors Util Mexico in best practices.” The facility performs progressive conventional and fineblank stamping, welding, swaging, progressive and multislide hardware stamping, and noise-dampening shim stamping. Fineblanking employs complex tooling to produce smooth-profiled finished parts in just one operation or press stroke. Unlike conventional blanking, the tool applies counter-pressure to the blank that allows the part to be cleanly sheared with exceptionally straight edges and particularly good flatness tolerances. Parts do not require secondary machinery operations such as grinding or milling. The process employs dies with very tight clearances—one percent or less. Parts that typically are cast and machined can be made with fineblanking in a single press setup, achieving dimensional accuracy (with the material thicknesses UTIL works with) to within ±0.05 mm, and edge perpendicularity to top and bottom faces to within ±0.0125 mm. Late last year, Util Canada took delivery of its new fineblanking line, equipped to take its technology to a new level of precision and robustness and help open doors to new customers and new markets. The line features a hydraulic press from Japanese supplier Mori Iron Works Co., fed by a uniquely specified feed line from Coe Press Equipment, Sterling Heights, MI. The feed line features a Coe Fineblanking Edition HD straightener, coil reel with HD holddown arm, and alligator-style peeler-threader. The straightener provides the necessary roll-force delivery and rigidity required to achieve flatness and dimensional-tolerance requirements for producing fineblanked backing plates. In addition to the power straightener (127 by 610 mm), the equipment setup includes a threading table (610 by 460 mm), for hands-free threading; and a 7000-kg-capacity by 610-mm coil reel with multiple hydraulic holddowns and motorized end wheels for coil containment. While braking-system components represent 90 percent of Util’s business, the firm seeks to diversify into different products and markets, and to open up new opportunities, Luppis and Petrazzini tell MetalForming. “There are thousands of components made from fineblanking,” Luppis says. See also: Coe Press Equipment Corporation, Mori Iron Works Co., Ltd.